He has been a featured guest with the Chameleon Arts Ensemble of Boston, the Daedalus Quartet, Les Enfants d’Orphée, the Northwest Sinfonietta, Pacific Baroque Orchestra, Philharmonia Northwest, and the Portland Baroque Orchestra. He was also founding co-director of the Seattle Baroque Orchestra with violinist Ingrid Matthews. In 2013, he launched Byron Schenkman & Friends, a Baroque and Classical chamber music series at Benaroya Hall in Seattle. 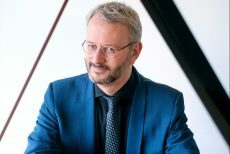 Schenkman is a graduate of the New England Conservatory and received his master’s degree with honors in performance from the Indiana University School of Music. He currently teaches at Seattle University and has been a guest lecturer in harpsichord and fortepiano at Indiana University.